This issue is 312 pp. (approx. 309,885 words). The fourth issue of The Confessional Presbyterian journal was the largest to date. A personal favorite piece in this issue was the translation of chapter 19 from Samuel Rutherford’s Latin lectures on the subject of the civil magistrate. The three part series was concluded based upon research into the federal period printers, T & J Swords. This issue remains in print. 3. American Presbyterianism, Geology, and the Days of Creation. By Frank J. Smith, Ph.D., D.D. 17. Olevianus and the Old Perspective on Paul: A Preliminary Report. By R. Scott Clark, D.Phil. 43. The Ministerial Shortage Problem in Presbyterian History & George Howe’s Appeal for More Ministers. By Barry Waugh, Ph.D.
52. An Appeal to the Young Men of the Presbyterian Church by George Howe (1802–1883). Transcribed by Barry Waugh, Ph.D.
72. According to Augustine. By W. Gary Crampton, Th.D. 122. John Calvin on Human Government and the State. By David W. Hall, Ph.D.
151. The Covenant Of Works Revived: John Owen on Republication in the Mosaic Covenant. By Michael Brown, M.Div. 162. 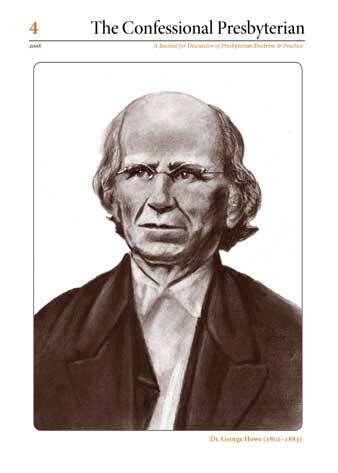 Samuel Rutherford’s Supralapsarianism Revealed: A Key to the Lapsarian Position of the Westminster Confession of Faith? By Guy M. Richard, Ph.D.
270. In Translatiōne: Samuel Rutherford: Examen Arminianismi, Chapter 19: Of the Civil Magistrate.